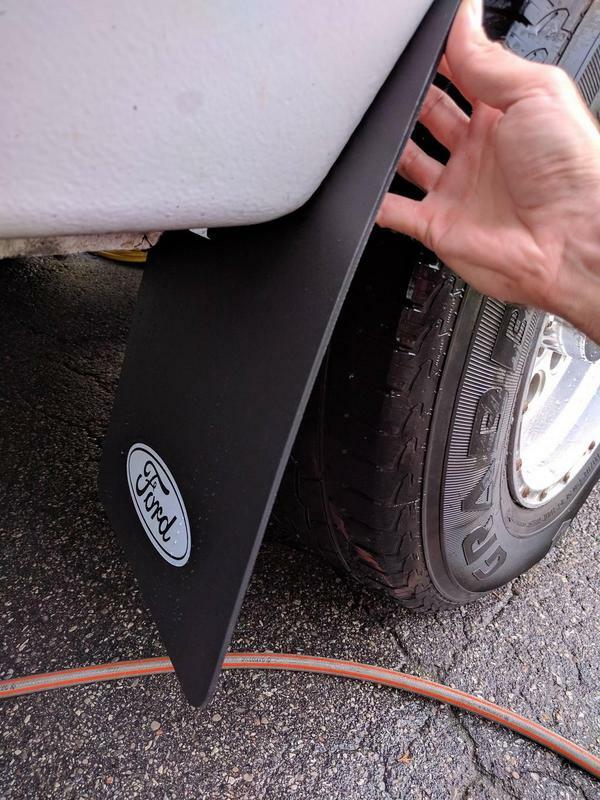 I bought the stock OEM mudflaps for my 1992 SMB Ford EB to help stop everything getting kicked up onto the side of the van during rain (my wide offset wheels certainly don't help). They come with 3 screws each and you're supposed to just screw them into the face of the fender. However, I've run into a snag. 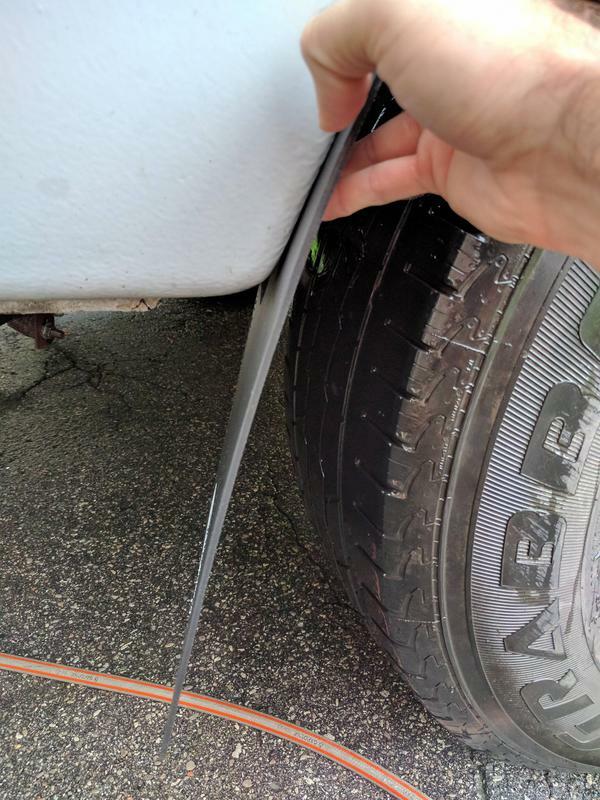 The face of the fender isn't parallel with the tread of the tire (especially in the rear), so if I screw them in as-is, they'll point toward the center of the van and look awful. Any ideas? Can anyone share some pics of how theirs are bolted up? Not as bad, but still not straight. Full time vanlifer in my SMB. I've yet to see any E-series with good looking or straight mudflaps... wish ya luck. Can you cut a slice (not a piece you remove) from an area of the flap you can't see, like the top inside that you could use to pull inside rearward, bend and attach to the pinchweld to keep it even at the bottom? Hey Flyview, I misunderstood what you were trying to do when I posted on the other forum. I thought you were trying to get the mudflap to sit perpendicular to the ground. My bad. The fender lip just needs some persuasion with a BFH. Works better with the tire off. That said.... Once it's all mounted up, nobody will notice but you, even if you just left it as is. This doesn't answer your question about mounting method, but I also considered installing mud flaps to protect the van body from rock damage. After looking into different options, I settled on getting a protective film applied onto the areas back of the wheels. Found a place in Huntington Beach that did a great job. The film is invisible, provides a protective layer against paint chipping and is easy to clean. 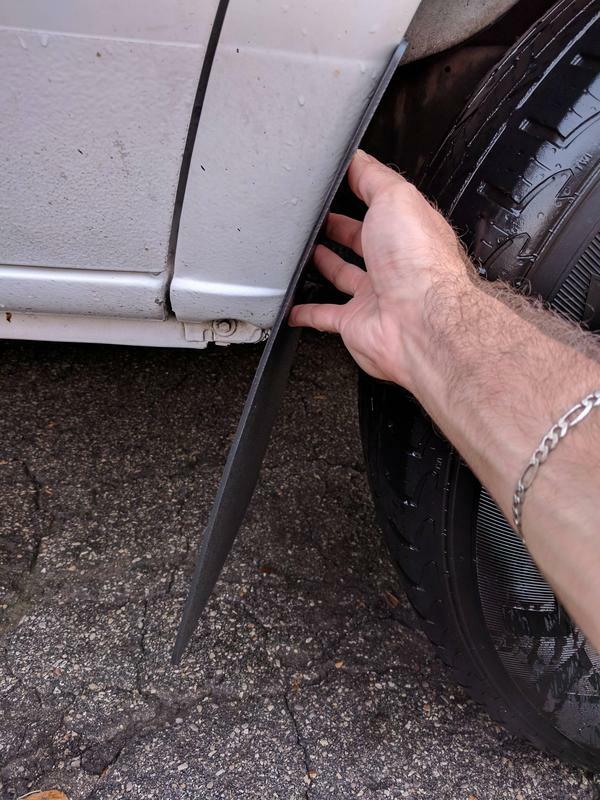 In the end, I'm glad I didn't get mud flaps for the reasons above, in addition to the fact that some folks here have written about issues with them when backing up. I prefer to keep from giving some state LEO's a reason to pull me over. Could you add a metal strip across the top that you could bend to form them the way you want them to sit? Many mud flaps are made this way. It makes em stronger as well, spreading out the load on the screws. Keep the ideas coming. The tricky thing is the space that needs to be filled in is at the outer edge of the fender that you can see. I could just mount a bar to it with a custom bracket and bolt it to the metal fender liner and not even use the fender at all. Check out these mud flaps I saw on a Bell van here in Canada. Anyone know what they are? They solve the problem with that external piece that pushes the outer edge forward by pushing against the side.